To see photos shot with this camera, click the appropriate Category at right. I’ve begun the expansion of my Kodak Retina collection. So enamored I am with my Retina IIIc, that I’m determined to collect and use more of the Retina cameras. To collect a sample of every model is probably out of my reach (or would just be a little crazy), but I’d like to someday at least have a folding Retina I and II in addition to my IIIc. 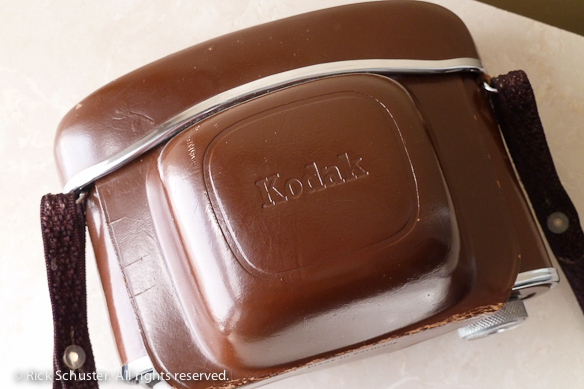 This German-made Kodak shares many characteristics with my Retina IIIc, but in a non-folding, auto-exposure rangefinder. 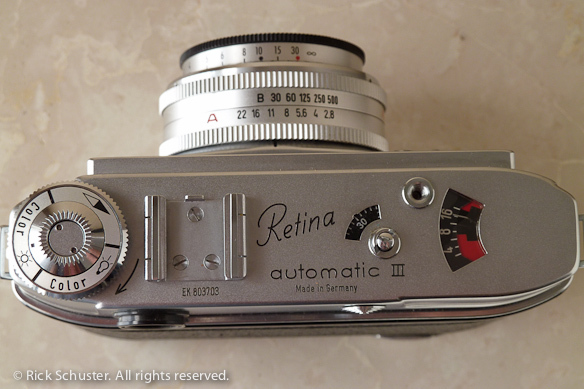 The Retina Automatic III was made from 1961 to 1963, and uses a Gossen selenium-cell-powered light meter to drive it’s shutter-priority automatic exposure mode. It can also be shot in full manual mode by setting aperture and shutter speed on the lens dials. 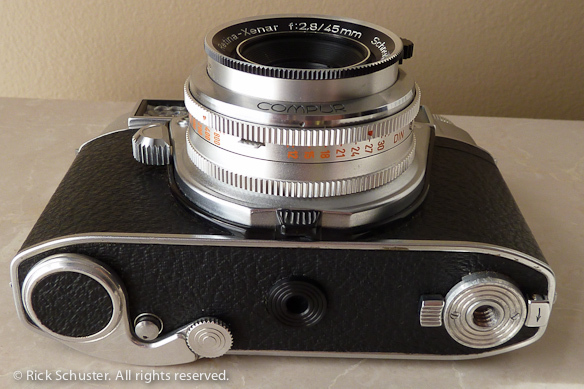 It has an f:2.8 Schneider lens, and shutter speeds of 1/30, 1/60, 1/125, 1/250 and 1/500, plus B. The camera takes no batteries, even in automatic mode, which I find remarkable. Also remarkably, the light-meter on mine still works accurately, so the auto-exposure system works great. The light meter needle on the top of the camera will also show you the proper exposure if you want to shoot in manual mode. I compared readings from this built-in meter to those from my Gossen Luna Pro light meter and they were pretty close. In A (Auto) mode, you pick a shutter speed and the camera will select an aperture based on the meter reading. If the light is too low to get a proper exposure at your selected shutter speed, a yellow “STOP” will show in the viewfinder, and it won’t fire unless you change to a slow enough shutter speed or turn the aperture out of Auto. 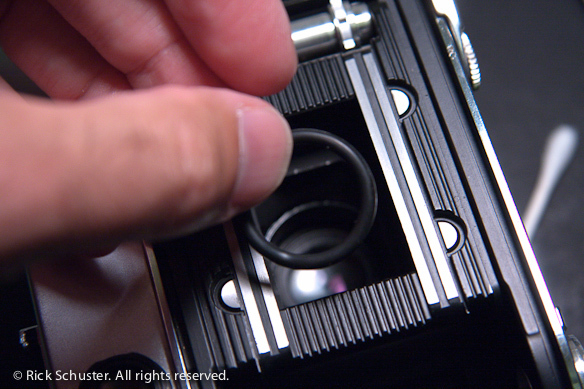 To set your exposure fully manually, simply turn the aperture ring away from A to your desired setting. The light meter even locks in with a half shutter push, so you can meter then recompose your image, which is great for shooting in tough lighting conditions. 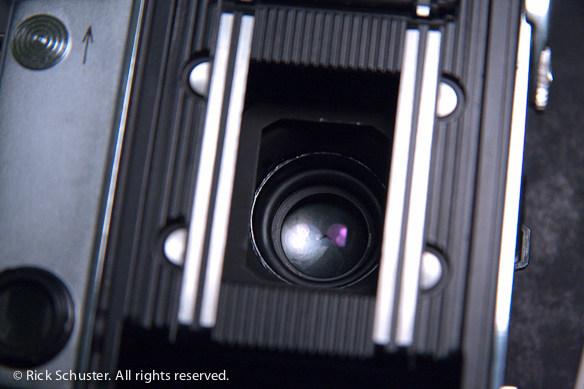 The viewfinder is big and fairly bright, and the center split-image rangefinder is easy to see and focus. It has nice bright lines framing your image, which are parallax-corrected, so they move as you focus closer to compensate for the parallax between the viewfinder and the lens. They’re only corrected horizontally though, so the framelines move left-right, but not up-down. To indicate the vertical parallax, there are two small marks toward the top of the main frame. One thing that takes a little bit of getting used to is the odd placement of the shutter button on the front of the camera to the right of the lens. Once you take a few shots, it becomes easy to find and actually feels pretty naturally holding and shooting, but at first your index finger will probably be searching the top of the camera for the shutter button. You might find it easier to hold the camera with your index finger on top of the camera, and push the shutter button with your middle finger. I find the camera easy and fun to use. I haven’t shot it enough yet to know if the lens is as remarkable as that of my Retina IIIc, but I’m impressed with this camera so far. For a $15 ebay purchase, it was a bargain. 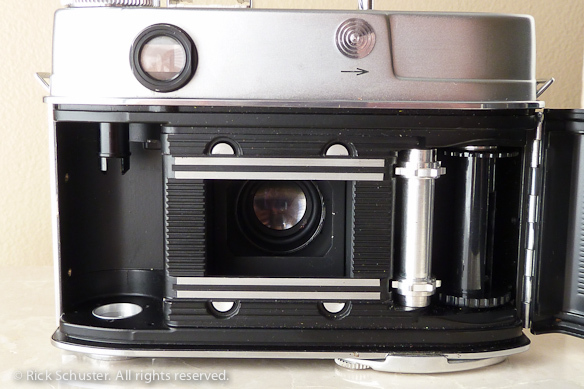 It’s in beautiful condition, and once I fixed the sticky aperture blades (details below), it’s worked great. 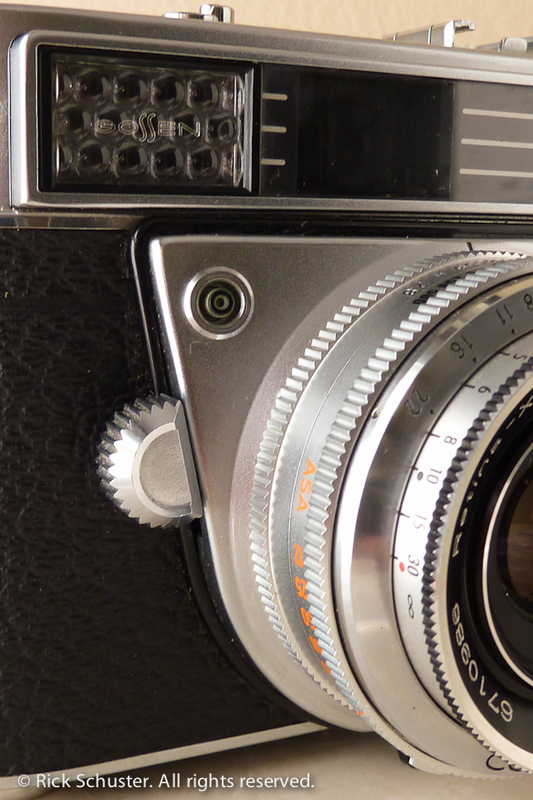 The design of the top of the camera is very similar to the Retina IIIc, except it doesn't have the dial for the light-meter on the right, it simply has a window showing the light-meter needle. 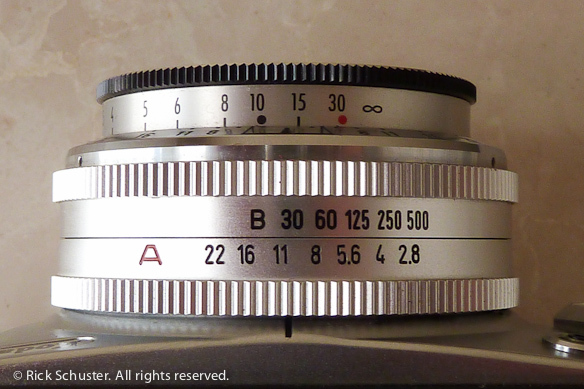 The needle points to the proper aperture setting based on the shutter speed you currently have selected (and based on the film ASA – 25 to 800 – selected on the side of the lens). 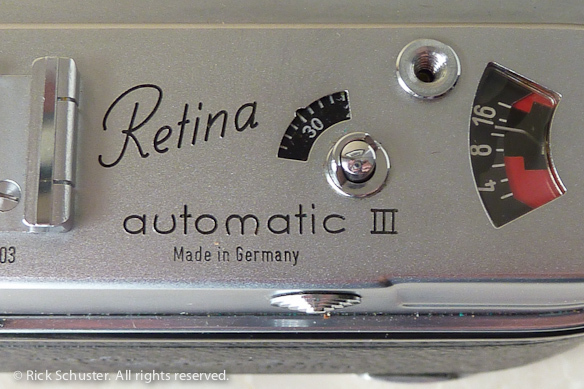 The bottom of the Retina Automatic III is nearly identical to the Retina IIIc, including the film-winding lever on the bottom. It's a little odd at first, but it's very easy to use once you've taken a few shots. After using it a while it actually seems more natural to me than using a top wind lever. The film counter counts DOWN from whatever you set it at when you load the film. 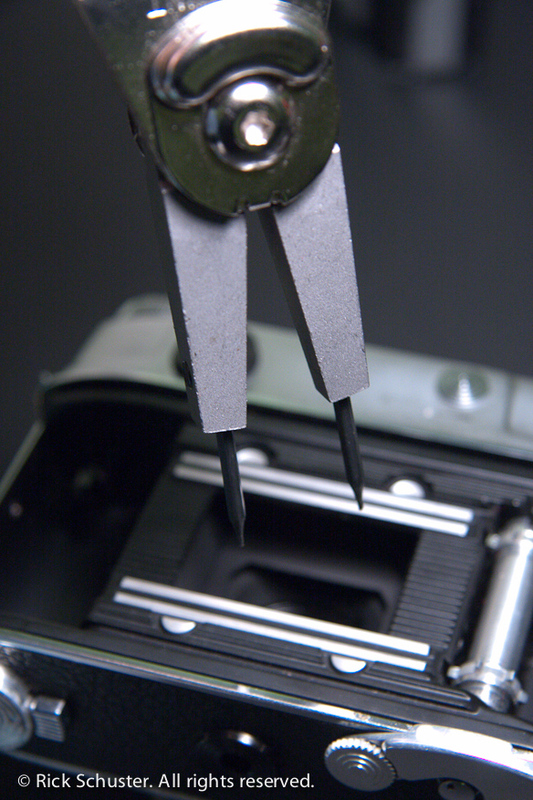 I thought that it had the same dreaded interlock as the IIIc, which prevents winding of film (and cocking of the shutter) once the counter hits zero, but mine doesn't do that. Either it's broken on mine (which is great, because the counter still works, but I don't have to worry about it stopping), or this model actually doesn't have the interlock. If you have a Retina that doesn't want to wind or fire though, be sure you understand how to reset the counter before assuming something's broken. To reset it, you hold down the small silver button on top, while pumping the flat button on back in the direction of the arrow. The slightly unusual placement of the shutter button next to the lens. When I got this camera it seemed to be working, except that the aperture seemed always to be wide open no matter how I set it. After experimenting with it for a while I realized that the aperture was simply closing extremely slowly when the shutter fired. The way this camera works is the the aperture returns to fully-open position when the shutter is cocked (by winding to the next frame), and when you fire the shutter, the aperture is supposed to close very quickly to the setting you’ve selected before the shutter opens. I found that when I set the shutter to B and fired, the shutter would open, then the aperture would slowly close to the right setting. I figured the aperture blades simply needed some cleaning, so I removed the rear lens element and placed drops of Coleman fuel on the aperture blades. After repeated firing and adding drops of fuel, the blades started moving faster and faster. Soon I was able to see the aperture closing fast enough for the slower shutter speeds, but it took a lot of cleaning to get it to function fast enough for the fastest speeds. It’s worked great since, and it’ll probably keep working great as long as it gets used now and then. Looking inside the back of the opened camera, it looked at first like there was no ring to remove to get the rear lens element out. Then I realized that there's a black rubber ring that can be easily lifted out. 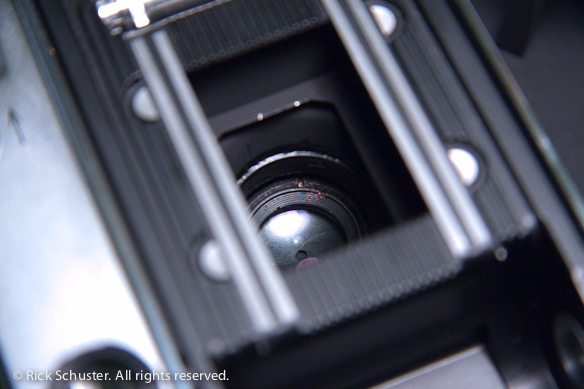 Remove the rubber ring, then you can see the notches in the retainer ring for the rear lens element. 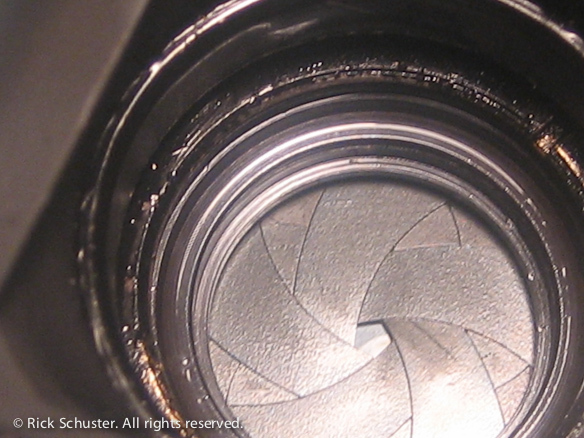 There are two rings, and just the inner ring needs to come out to remove the lens element. The trouble was that both would turn when I turned the inner ring. So I had to carefully hold the outer ring in place with a small screwdriver while turning the inner ring with my split-ring pliers. I was lucky enough that my split-ring pliers fit in the opening and had just enough room to turn. I've found these to be a good substitute for a spanner wrench, though it's too bulky to fit in some lenses. Here you can see the rear lens element removed, and the aperture blades accessible for cleaning. I just got the same camera and I had it CLA’d at Chicago Camera on Wabash. I am not sure if the accessory flash shoe is “hot” or not as I wanted to use it with Pocket Wizard. My PC contact works. I will put a roll of film into it soon. I’ve come to appreciate this camera more and more. 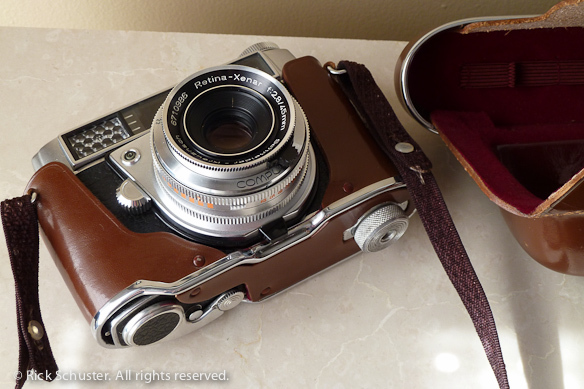 I love its simplicity of use, and the pictures it takes are every bit as good as what come from my Retina IIIc. By the way to William Kazak, no, the flash shoe is not hot. You’ll have to plug a cord into the socket at the front of the camera. The camera is set up solely for “x” synchronization, which means electronic flash. “M” synchronization is not available. But flashbulbs aren’t much used anymore, anyway. Thanks for the comments. I need to pull this camera out more often! I shot a roll of color. The shutter on auto. No problems. I want to try a studio flash next. a bit over-engineered but that’s what Retinas are all about! 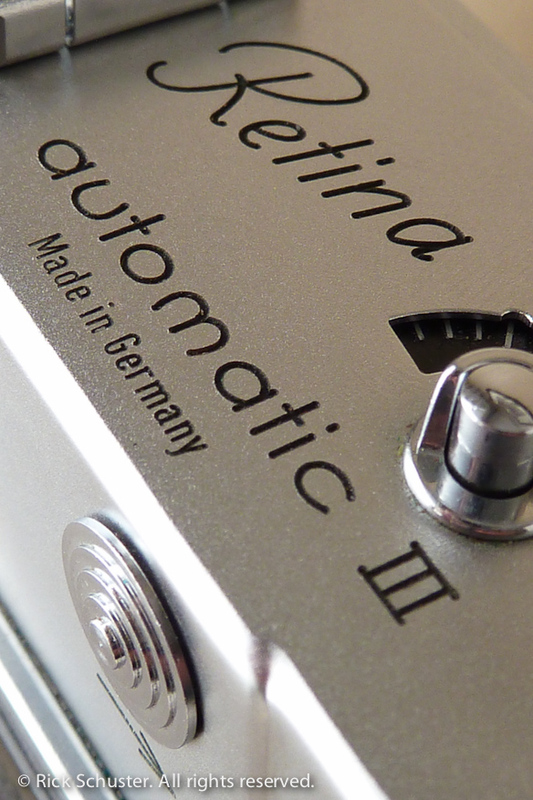 My Auto lll Gossen meter is still working nicely-just amazing! Definitely worth the fix if possible. I got one of these at a photo swap meet 5 years ago and love it. The viewfinder is great if you wear glasses. All you need to do flash photos is a simple PC synch cord. One end will plug into the flash and the other one plugs into the socket at the top front of the Retina just above the shutter button. And the cool thing is that the flash synchs at ALL shutter speeds! Great to use for outdoor fill flash. Hey Rick! 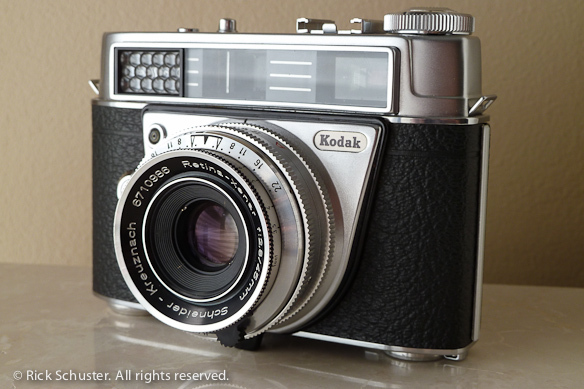 I have one of these and heartbreakingly the shutter has just gone ;( Our local camera repair guy says the only way to fix it is to fuse it with one that has a working shutter, but perhaps something else broken. Is there ANY chance you have one laying around that I could purchase off you? Absolutely loved mine!! Hi Jessica. I don’t really want to sell mine, but you should be able to find one on ebay for about $40 I think. Just be sure it’s a reputable seller with close to 100% positive feedback and is returnable, not ‘as-is’. Good luck!